Both Albert and Nick of The Strokes used this amp. In an article from November 2007, The Cooks guitar tech Adam Stockdale talks about Hugh Harris' amp setup: "Hugh runs two Hiwatt Custom 50s in the front, and he's got two 2x12 cabs for each of those," explains Adam. "One is in the bright channel and one is in the low channel, so that is the top of the sound and the middle of the sound. Then behind the Hiwatts at the back, he has a little hand-wired Marshall — a 20W thing that we just crank and let the valves do the work — and that provides the bass. So, if (front of house) are having trouble, they just adjust whichever one they want to get the right frequency, and get the best sound out front. They're just run through a five-way selector that goes into a line selector, which the guitar goes straight into. So, the signal to the amp is direct. There's a main pedal board in one of the loops and then I put a spare pedal board in the second loop — in case anything goes wrong — so they can just switch between. They've got a lot going on, but it's the safest way." The original article can be found [here](http://www.performing-musician.com/pm/nov07/articles/thekooksguitartech.htm). Hugh's Hiwatt Custom amps are white, as seen in the source pic. Adam posts this image from their show in Italy and the amp shown on the right is a Hiwatt Custom 50W. 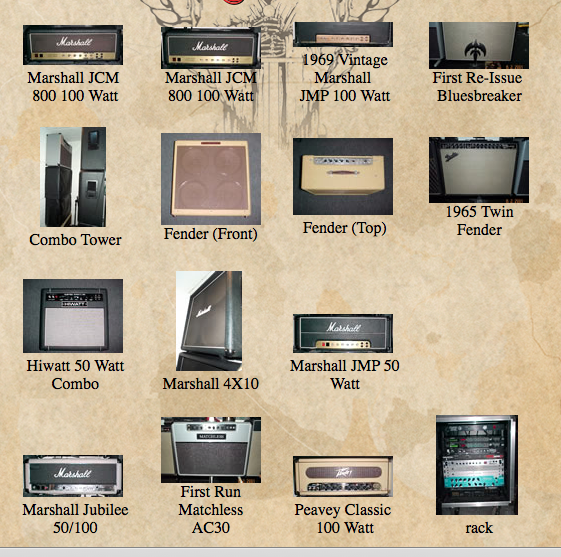 According to [this page](http://www.michaelwilton.com/amps.html) of Michael Wilton's website, he uses a Hiwatt Custom 50W 2x12 Tube amp. This picture shows Kieran's brand new Hiwatt Custom 50. It has been customised to say "Different Creature" in reference to their second album. "I used mostly my two Hiwatt Custom 50 combos and recorded them with Audio-Technica AT4081 ribbon mics." In this article Mark Bowen's gear is listed near the bottom of the page including his Hiwatt Custom 50 SA212.